What We Do | Turya. Marketing. Research. Advisory. Turya supports global technology firms and startups with marketing consulting, industry research and seed investments. 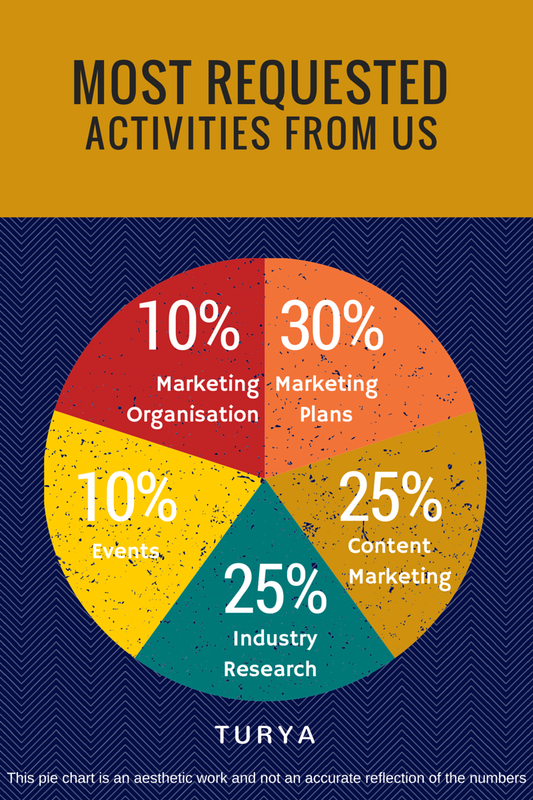 We strive to devise marketing strategy and programmes that make a big impact with cost-effective solutions. Turya is a collective of agencies and individuals who are passionate about technology and marketing. There are industry experts, researchers, designers, writers, event managers, analytics experts and programmers in the team, who are roped in based on each client’s specific requirements. Turya is truly international, with a partner network in 3 continents. We believe in a simplified, jargon-free existence, and that reflects in our approach to delivering marketing programmes to our customers. We provide what the customer needs – not long reports or action plans that are impractical to implement. We believe that simple actions sometimes provide the best results, and are always on the lookout for those for every firm we work with. Turya is a collective of agencies and individuals who work from different locations. It is headquartered in a lovely building with river views in Southbank, London. What does Turya mean any way? Turya is a state of mind where knowledge and awareness are at its highest. Sounds achievable!